Insert Style floral - plainfloral - bride tribefloral - bridesmaidfloral - maid of honorfloral - matron of honorfloral - mother of the bridefloral - mother of the groomfloral - thank you tie the knotfloral - will you tie the knotfloral - future mrs. 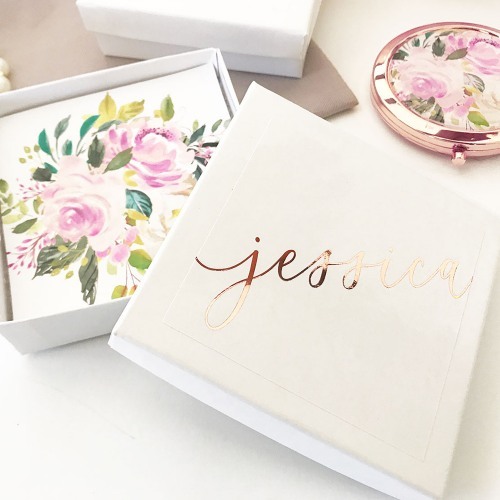 The Personalized Jewelry Gift Boxes make packaging any jewelry gifts for your bridal party, friends, and loved ones easy! The boxes have a glossy look and are personalized with our beautiful foil colors or in black. Choose from one of our beautiful floral insert cards to gift to your special ladies! They are sure to love this useful gift.